b.i ) The first state of the design comes as an evolution of Alien III Side view 1 which we still only have a low resolution image of. Here tongue resembles a leech with a corkscrew drill at the end. 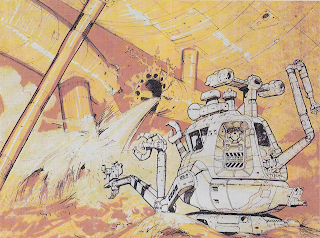 b.ii) Looking at the arm positions, I might wonder if Giger took referenced Chris Foss' "waldo-like" repair machine designs for the movie. 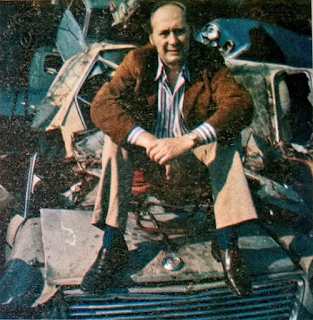 b.iii) See: References photograph of JG Ballard from the Radio Times, advertising the BBC program Omnibus that was televised on the 13th December 1973? Further into the evolution of the design, the form of the creature's body becomes more recognisably humanoid. 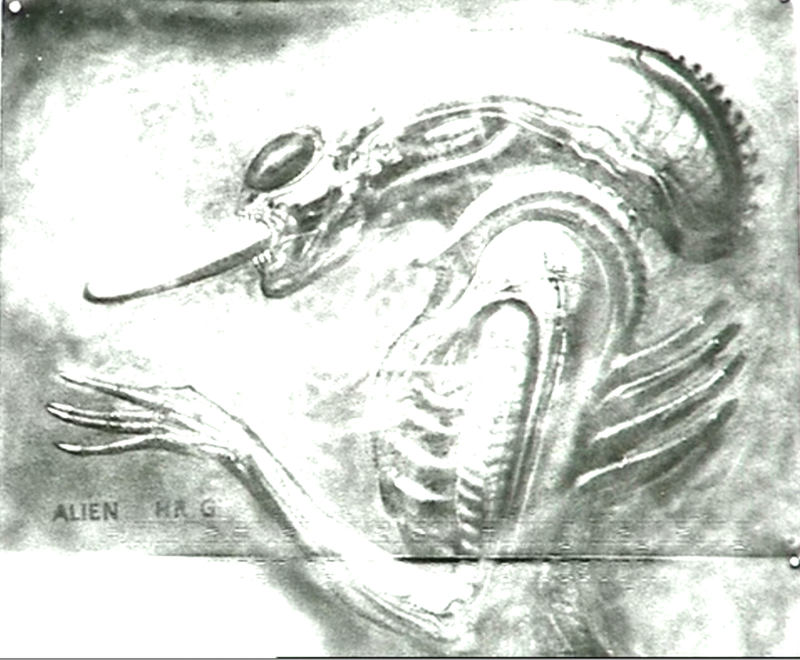 The new design for the tongue starts out as elongated and curved up at the end, the shadow part of the tongue in this terrible photo glimpsed in the Alien Evolution documentary makes it look like an Egyptian brain hook for debraining corpses in the mummification process, although it might have simply looked like a baguette sticking out of the creature's mouth. But later in the development of this painting, the tongue became tubular with a sharp point on one side and a protruding spine sticking out ready to puncture its victim. c,ii) Tentacles or spines sticking out of the lower part of the back stood nearly vertical in the final version of this although at one point it has a row of four pipes sticking out of the back. 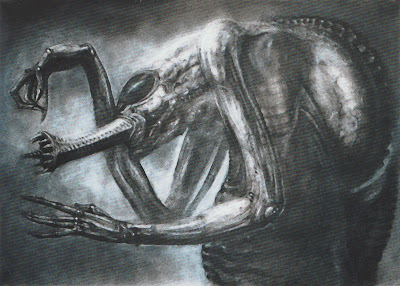 c.iv) This alien had no dome stretched across the cranium, or if it has, the goggles and the spines at the back are sticking out of the dome. 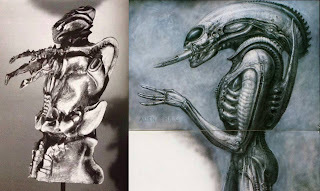 d) Alien stage III version 2 (side) references alien life form concept for 2001: A Space Odyssey?